"Letters From Rapunzel is definitely my favorite book. I love how there's so much imagination in the book. I still wonder how the author thought of this. It is really touching too. I laughed and I cried a lot. I really felt that a preteen wrote this since 'Rapunzel' seems to think just like my friends and me. It was really funny how Rapunzel compared reality to fairy tales." I've always loved fairy tales, and as a child, read every one of Andrew Lang's "Fairy" books. Later, I admired Donna Jo Napoli's re-tellings, especially Zel (a version of Rapunzel), and William J. Brooke's playful collections, including A Teller of Tales. One of my first published short stories was an original fairy tale, "A Tale of Quiet," which appeared in Cricket magazine in May 2000. My favorite fairy tale is "East of the Sun, West of the Moon," probably both because of its fabulous title, and because the girl gets to rescue the prince. Why did I write the book as mostly letters? Maybe because when I was growing up, I had a hard time talking about anything emotionally risky. So I wrote letters instead—to my family, to my friends, and to the man who later became my husband. I also enjoy reading collections of letters, and one of my favorites is Dear Genius: The Letters of Ursula Nordstrom. Many of the authors to whom she writes in the 60’s and 70’s were creating the very books that I was carrying home from the library as a child. In the spring of 2004, I loaned Dear Genius to my mother, who had just finished reading it when I called to tell her that that Letters From Rapunzel had won the first annual Ursula Nordstrom Fiction Prize! Terri Windling, winner of a Mythopoeic Award, writes about the Rapunzel fairy tale in the Spring 2207 issue of The Journal of Mythic Arts. Let me get right to the point. It’s the middle of the night, I can’t sleep, and YOU are the pea under my mattress. This letter’s about my dad, Aaron Brogan. I found a piece of a letter he was going to mail you, torn up and stuck down the side of his chair. That’s how I got your address (part of it, anyway–I couldn’t find your name). The rest was torn off. I wish I’d found it sooner. Maybe then I could’ve written you right away, and asked you how to save him. Because last week he fell victim to the Evil Spell again. The last time this happened, he had to be away for three days. This time, he’s already been gone a week. And now my mom says it could be another month! So if you’ve been wondering why he hasn’t written you, that’s why. But please, please, don’t give up on him. My mom says it’s an illness, not an Evil Spell, but I know I’m right. Dads don’t stop talking just because they’re sick. Dads don’t forget that their daughters are supposed to get off the bus at 3:05, and they don’t sit in the house with the lights out and not answer the doorbell when it rings. Dads, at least my dad, are home every day to meet you and have popcorn and root beer. I have to get to sleep now, before Mom gets home from work. She’s usually not this late, but I guess there was a baby rush. Her record’s twelve babies in one night. I think that’s why I’m an only child. P.S. That’s not my real name. After all, I don’t know YOUR real name yet. And yes, I know Rapunzel didn’t have a pea under her mattress. Wrong story. I’ll explain tomorrow. Tomorrow I’ll have LOTS of time to write. P.P.S. Tell me about you. How long have you been my dad’s friend? Where did he meet you? Are you a poet too? Letters From Rapunzel first appeared as a scribbled book title idea in my journal of June 1997. 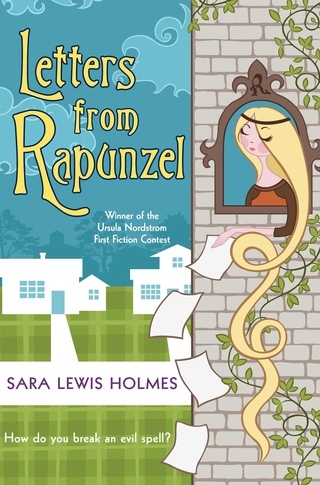 Much later, in March 2001, as I tried to ease into the rough draft of my first novel, I pretended that Rapunzel was locked in her tower and writing to me. To my surprise, I found out she was not a fairy tale character, but a real girl. A girl with great gifts who didn't know how to use them. A girl who saw everyone in her life as part of a very imaginative story. A girl who desperately wanted to rescue her father, but didn't realize she needed to rescue herself first.